Matt & I met July 28, 2010 at my oldest brother Derrik's birthday party. My bestfriend Amy and I had just gotten home from a summer church concert and when we walked in & saw Matt we were both like... okayyyy who's the tall cute older boy! Haha! I initially thought he was the cutest ever, but was also my brothers friend and several years older than me, so I wasn't sure he would ever think of me that same way. We messaged on Facebook a little bit but he was up at Western Washington University & I was just going into my Senior year of high school, so I just kept dreamin' haha! Over the next several months, we went on many double dates with my brother & his girlfriend (now wife). I just thought that I was being asked to go because they needed to even out the wheels, and Matt was super nice so maybe he was just thinking to invite me to be kind. I had NO idea that Matt was beginning to pursue me and pan these dates to get to know me better! We went to the fair, a concert, out to eat several times, and he would come spend time at my families lake property, which is my favorite place. My little crush started to GROW big time. One weekend Matt had come down from school to visit me, like he often did, and right as he was leaving he ran back inside to my parents house and kissed my cheek! The weekend after that he asked my dad if he could officially date me, and on April 9th we became a couple! I love our story because it's so much more than dating; we had grown to really like each other from hanging out and going on double dates over the last 8 months, that it felt very natural! I was still in shock that my boyfriend was a junior in college though HA! Okay so the story behind this picture: Matt asked me to my senior PROM but surprising me at my car after church one night. He had balloons, my favorite candy, and had written all over my car. I will never stop laughing & loving him for the fact that he came to my prom as a 21 year old. His mom even had to sign a waiver for him to come since he was over 20.. HA! Best night, so many fun memories we have over the years! P.S. should I bring orange & rhinstones back?! Fall 2011 I decided to attend Western Washington University in Bellingham, like my two older brothers, and Matt! We had one year together there, him as a senior & myself a freshman. It was awesome. We made so many friends & memories together. 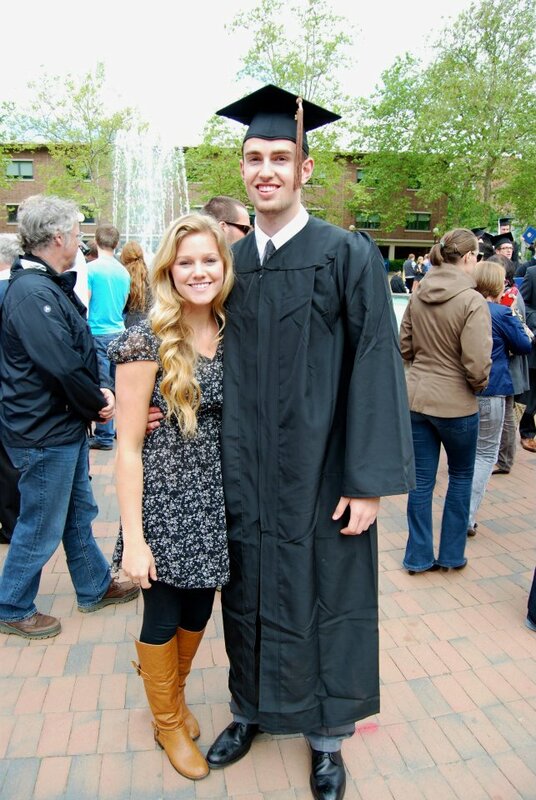 Matt moved back down South after he graduated in the Spring of 2012, and I stayed in Bellingham to finish school. It was really hard because we had basically only been dating a year & it really was difficult to stay positive during that whole time. You just want to sometimes hangout with the person you're dating, without having to make big plans or drive hours. It was tough, but Matt came up at least once or twice a month!! We did two years of long distance (my sophomore & junior years), until my senior year Matt surprised me by moving BACK up to Bellingham to be closer to me. He still had a lot of friends from college who were living there, so it was an easy transition for him to move back up and live with them! Do you remember when planking was a huge thing haha!? This was in my college dorm freshman year! I lived with my bestfriend Jaclyn & Matt would come hang with us all the time! Fast forward to October 30, 2015.. the second best day ever, next to our wedding of course haha! Matt proposed! Let's be real, I dreamed about this day for YEARS. We had been dating over four years at this point, so pretty much every time we had dinner plans, or went on a date, I thought it was going to happen haha! Matt definitely kept me on my toes! Little did I know that when Matt asked me to go to his work dinner that night, and my boss magically gave me the day off without me asking, he had a little more planned for me than I expected. Matt picked me up for his "work dinner" and said there was traffic in Seattle so the dinner was pushed back an hour. He suggested we drive through Edmonds first and maybe get a coffee. The beach in Edmonds was kind of our place. It was where we first talked about being boyfriend & girlfriend, had our first kiss and had many dates over the years. It had been pouring all day long, but the rain stopped and the sky cleared up as we stepped outside the car and walked hand in hand down the pier, laughing, talking, and enjoying time together. When we got to the end of the pier he took my hands and started talking about us in a way he never had voiced before, then got down on a knee.. I don't remember fully what he said or how I replied, I just know my heart had never been so full! My brother and his wife came out of nowhere with their cameras, and had been taking pictures of us the whole time! Our parents came down the pier to celebrate with us; I had no idea that it was happening, let alone that our families were there hiding and watching it all! Matt suggested that before I call my friends, we take a few minutes to relax and go eat at our favorite restaurant right by the beach! I was hesitant because I wanted to call & FaceTime all my friends, but thought he was right; that it would be good to soak it all in and relax together for a little before telling everybody! So we all walked over to Demintris, right on the water in Edmonds, and I was thinking it was going to be just our families. When we walked in our best friends were already seated and there to celebrate us! I have never felt more loved & special in my whole life. But even more than that I felt at peace & excited to be marrying my favorite person! It was perfect.